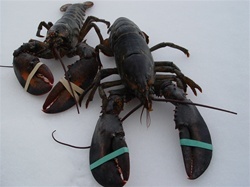 Two 3.0 to 3.25 LB LOBSTERS. These lobsters will fill any Lobster lover's appetitite. Two 14-18 Ounce Colossal Tails- ALMOST SOLD OUT!! !